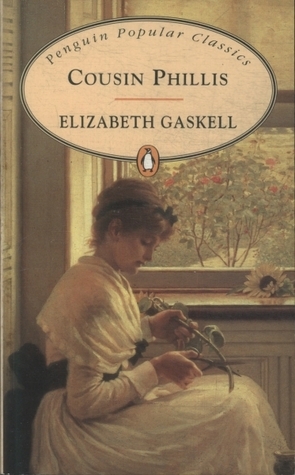 Elizabeth Gaskell (1810-1865) was the author of 15 novels, novellas, and story collections, the best known of which were probably North and South (1855) – which I think of rightly or wrongly as Jane Austen with steam engines (Gaskell did cite JA as an influence) – and The Life of Charlotte Bronte (1857). Her novel Ruth (1853), the story of an unmarried mother bringing up a son, I have mentioned a number of times, and I and/or Lisa (ANZLL) who is reading it now, will “shortly” produce a review. Gaskell was brought up Unitarian, by her aunt in Cheshire following the death of her mother, and married a Unitarian minister. Dissenting religion and the plight of the poor, as well as strong women characters, are all important themes in her work. I came across the novella Cousin Phillis (1864) recently, in a Madrid book stall (I can’t imagine I’ll ever be able to say that again) and coincidentally, read it in conjunction with Ada Cambridge’s The Three Miss Kings (1883) which I have with me on kindle. The two have similar themes – innocent and religious young women falling in love – and I plan to compare them in adjacent reviews. For Cousin Phillis, Gaskell assumes the voice of a young man, Paul Manning, not very successfully IMO, and the story consists entirely of his observations of his (second) cousin Phillis falling in love, and of his own unfortunate interferences. Manning is from Birmingham where his father is a tradesman and an inventor. His father’s industry and success enable him to raise Paul up one level in class, as apprentice to the relatively young Holdsworth, the experienced engineer/manager of a crew putting in a new railway line in the south of England. In one of his weekly letters home Paul mentions that he is working near a town that his mother recognises as the home of her cousin who is married to a farmer who at the weekends is an Independent clergyman. Paul, who has been diligent in his attendance at Chapel is not keen on having to waste his limited free time on another clergyman, but does as his mother bids and goes out to meet his new relations, the Holmans. The beautiful and demure Phillis, a couple of years younger than Paul, is their only child. Paul finds that he is both welcome, and enjoys being on the farm, and slowly he and Phillis become friends. Holdsworth is introduced to the farm when he becomes ill and needs somewhere to recuperate. Long rows of peas stretched at right angles from the main walk, and I saw Phillis stooping down among them, before she saw us. As soon as she heard our cranching steps on the gravel, she stood up, and shading her eyes from the sun, recognized us. She was quite still for a moment, and then came slowly towards us, flushing a little from evident shyness. I had never seen Phillis shy before. Spoiler alert. Phillis, an innocent, reacts to Holdsworth’s attentions by falling in love, but before anything can happen, or even be said between them, he is offered, accepts, and leaves immediately to take up employment in Canada, telling Paul that he will be back in two years to offer for Phillis. Phillis falls into a decline, Paul revives her by telling her what Holdsworth has said, but before the two years are up a letter arrives from Holdsworth telling of his marriage to a Canadian girl, Phillis collapses and Paul must admit to her father the part he has played. Phillis collapses with brain fever and is unconscious or in a delirium for weeks – is that even a thing now, or were brain fevers, and for that matter hysteria, purely C19th illnesses. Religion is present throughout this story without being intrusive, so that Phillis is just as moral as any other middle class young woman of her time. Though, while it looks like Phillis will die, Holman’s fellow dissenting preachers, ride out to argue with him to resume his ministry: “First, God has given you the opportunity of showing forth an example of resignation”; and “Secondly, we would have you listen to the voice of the rod, and ask yourself for what sins this trial has been laid upon you”. Holman, no doubt reflecting Gaskell’s own views about these strict interpretations of the situation, refuses both to give up his bedside vigil, and to accept that his daughter’s illness might be punishment for his pursuing his parallel vocation as a farmer. In Ada Cambridge’s The Three Miss Kings, as we will see, Cambridge, who was married to a Church of England minister, has similar concerns about the strict application of Church dogma, while insisting as does Gaskell, that young women should act both morally and circumspectly.